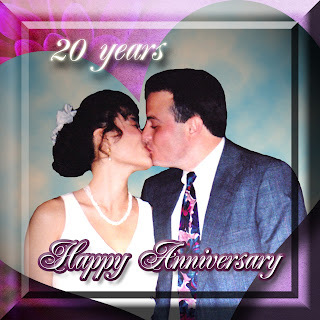 Twenty years ago today, the Lord chose to unite me and my beloved husband together in holy matrimony. We were both young, naive about marriage and still a bit prideful and self-serving. Naturally our pride deceived us into believing otherwise. The first several years of our marriage were rocky as we both tried to mold one another into our own image of what we thought a husband/wife looked like. With one child, and conversations about divorce, we were nearly done. But God's plans are never thwarted. The Lord decided that we would be married until death do us part and have two sons with whom He would also use for His glory. As we've learned, our marriage isn't about the two of us—it's about Christ. Out of God's great mercy and compassion for the young fools we were, He granted us the wisdom we finally asked for and committed to love one another always second to Christ. We took divorce off the table and resolved to keep Christ as our First Love; to serve Him, to bring Him glory and please Him in every way with our marriage. No longer seeing marriage as a way to feel "complete" or satisfy any self-fulfilling desires, we pressed on to love one another not because to make each other happy, but because God created our marriage to make us holy and conform us more and more into the image of Christ. We've had many trials in our marriage. Trials with extended family. Trials with friends. Trials with our kids. And through it all, God made our marriage stronger and more firmer in Christ. With every wind of adversity, we hunkered down together to find our identity, our purpose, our lives, hid in Christ alone. I strive to the be biblical, Proverbs 31 woman first to please my Lord, second to serve and honor my husband. My husband strives to live up to all that is written in God's word of what a man after His own heart looks like (Eph 5:25-31); and he does this well. Though I still have a long way to go, the Lord has given us both the peace and love we need to press on together as we long to deepen our relationship with Christ as "one"—living only to please, honor and glorify the Son of God. We are here to make much of Jesus. Not of ourselves. May the LORD receive all praise and glory for the 20 years He's generously granted us and for whatever more He chooses to give us. May the name of the Lord forever be praised. Amen. for the LORD has dealt bountifully with you."